I have been very lucky to work with amazing couples and families! Below are reviews from real weddings that I have personally helped plan and coordinate. Thank you to all of our beautiful couples! Lindsay is amazing. Very organized, always answers emails/texts/phone calls either the same day or the next day. Whenever an issue came up she would say no problem I will take care of it. She has a very calming demeanor. We loved how our wedding came out. I wasn't worried about anything and I was able to just enjoy the day with family and friends. 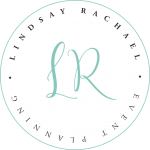 I would highly recommend Lindsay to anyone needing help with event planning. It was great working with Lindsay. I planned my wedding over a year's time from long distance, and she always answered emails and texts within a timely manner. She is an asset to anyone who is planning a wedding in central florida because she knows the vendors in the area. Even if you don't want full planning services, Lindsay will make sure all the details are perfect on your wedding day. I couldn't have asked for a better coordinator for my wedding. Lindsay was amazing. If I had any questions or concerns, all I had to do is text her and she took care of it. She was on top of everything. She made my wedding day so relaxing. I am extremely blessed to have found Lindsay. I worked with Lindsay on planning my April 27th, 2012 wedding. She was amazing through the whole process, always available to answer any question I had either through email, phone, or in person. She as extremely reassuring that she would handle everything on the day of the wedding, which was nice for me as I am somewhat of a control freak. On the day of the wedding, Lindsay and her assistant Kaitlyn did an amazing job setting up my venue! I was a stress free bride, because I knew everything would look amazing in their hands! My guests were so impressed with how everything turned out and so was I, it turned out better than I could have ever imagined. So many times throughout the day of the wedding I told everyone how glad I was I invested in LRE. My family completely agreed, as they know I would have been so stressed out the day of the wedding without her help. Lindsay helped me with everything from meeting/helping me choose vendors to lighting candles the day of the wedding, to sending us off on our way to Aruba for the honeymoon. She really took care of everything, and I am so glad I had her help. I would recommend LRE to any bride with an upcoming wedding, she really gives you peace of mind! Working with Lindsay was amazing. She made planning our daughters destination wedding from Canada doable. Whenever we had a question or needed a recommendation she was there and never tired of answering our questions. The day of the wedding she helped make our daughters dream come true. It really was a magical day for Brittany and Lindsay was there every step of the way! I recommend Lindsay to everyone and anyone who is even thinking of a planner. She was absolutely incredible!!!! I'm the mother of the groom and met Lindsay the day before the wedding when we all got together to go over the wedding details. I liked her organized, calm and reassuring presence. On the day of the wedding there were the usual last-minute glitches to plans: rain for an outdoor wedding, wedding guests leaving the small reception 45 minutes before the end; Lindsay just calmly rearranged things. My family agreed it was a magical time!! Both my son and his bride had been looking forward to their special day for a year. Lindsay helped make their dream come true. Thank you, Lindsay. My husband and I hired Lindsay to be our day-of coordinator, and she was absolutely fabulous! I really don't know how we would have pulled it off without her. I, being a DIY bride, had a lot of crazy ideas, but Lindsay worked with me to make everything work perfect and look beautiful. Not only did she help me not to stress out (I probably would have had a mental breakdown without her), but she really helped make our day amazing. She has a lot of great ideas - this girl knows her wedding stuff! Lindsay controlled our insane families at the rehearsal to make it run smoothly, and at the reception she was like the little worker bee behind the scenes making everything happen. She is completely reasonable, as far as pricing goes - for what she does, her work is worth every penny and more! Thank you so much Lindsay (and Mark) for making our wedding wonderful! As a bride to be stress is an all to familiar feeling. I had just moved to the area to start grad school and was living all by myself and wanted to plan my wedding to be in Florida, but I knew nothing about the area and what's worse I knew NO BODY. When I came across Lindsay and decided to hire her I can say other than saying "I DO" it was the best decision in the wedding planning process I made. She is so organized and helped keep me organized even while I was up to my eyeballs in school work. I never felt overwhelmed and never felt pressured into changing any of my visions, or by a price tag. She is efficient, reliable, dependable, and always made me feel like I was top priority. She is accommodating, hard working, genuine, and helpful would be the understatement of the year! I felt prepared the whole way through and never had that dreaded "Bridal Melt Down" that everyone said I was so doomed to have- I can attribute that to Lindsay. Because she was so on her game the whole time, and helped me stay on top of everything I was able to totally relax the days preceding my wedding and let it become the most magical fairy tale day I have ever experienced. Thank you Lindsay for not just being a HUGE help but being a friend and coming with me to hair consultations, floral consultation, etc. You are the coolest chick around and ROCK the wedding scene! So if your man pop's the question, after you say "YES!" say "I'm calling Lindsay!!!"